Say, I've got some of those NOS GI 1N456's headed my way from Small Bear (they're the original diodes for the Ampeg Scrambler, sez the Small Bear site) and got enough to have some extras lying around. If I were to put those in the Bosstone circuit, I'm guessing I'd probably have to add some sort of gain stage. Doesn't look like an LPB-1 tacked onto the back end of this thing would cause any weird impedance problems... or would it? For some reason I can't go back and edit my previous post, so I guess I'll make a new one. What do our resident analysis gurus think might be the difference(s) between these two Bosstone clones? I think the second, the "Bag of Boges" might have either higher hFE transistors or larger caps. I'm going to test that theory later this week once I get some more stripboard. NOTE: For some reason, I'm not able to edit or delete my previous two posts in this thread... I'd like to delete the first one and roll the second one into this one. Posting three times in a row makes me feel really lame. I used mylar caps for the .022µfs and multilayer ceramics for everything else, if that makes that much of a difference. I thought the octave down stuff came with Aron Nelson's trick of increasing the value of the input cap. I don't know if it is something to expect out of stock builds. try bigger values on the other caps too, there's a range of tones to be got from swapping them around. I went for 0.082uf on the input (with a 0.047uf on a switch) and 0.056uf for the other 2, very beefy, monster fuzz with octaves ghosting in behind. I put in a big muff tonestack with a lpb recovery stage too. But here`s the catch - I want THAT sound - as soon as I switch on the Bosstone on in my chain - sort of a DIY octavia type - without having to adjust the vol and tone of my guitar on the fly. Is that possible? Is there a magic fix? I find most of the interesting fuzz sounds I crave are with the vol backed off on the guitar- it would be great to have say, a mini-sized stompbox with a circuit that could instantly cut my guitars output....can it be done? Anyone else have the same idea? That´s easy to be done. 1) Recreate your favorite volume control setting with two fixed resistors. This cuts the volume down to the desired level. Buffering may be necessary. 2) feed this into the bosstone. 3) compensate the resulting loss in volume with a small amp after the circuit and you end with unity gain. Unless I'm remembering wrong, this is the fuzz on the first Spirit album. Randy California sounded great with it. The voodoo labs people were selling one for a while. Maybe that schematic is floating around. I have built one, read my report here: http://www.diystompboxes.com/smfforum/index.php?topic=70080.0. In this forum there is quite a few posts on the bosstone so the report landed there. I was all in all not overwhelmed by its sound, does not suite my playing style, so I suspend it temporarily. Hey dudes...this might not be the correct place to post this (since you guys build these things yourself) but I figured I'd throw it out there. I have a CA Jordan Bosstone clone made by Creepy Fingers (bass player from Fu Manchu). I picked it up on Craigslist from another guy, but I think I've decided fuzz doesn't work well in the mix of my band. My simple overdrive pedal is way smoother. So, I was wondering if anyone wanted to buy it? Or, I'd be willing to trade for another pedal...I'm into virtually anything that's cool, but I'm specifically looking for an analog delay. I'm looking for $125 or OBO. Anyway, sorry to be that guy that creates a profile just to sell something. I just thought I'd go to the people that appreciate this sort of thing rather than the regular old Craigslister. I promise I'll stick around and be a good forum member, but I am just getting into pedals for real, so I don't know how much help I can be. Either way, get at me! Just built this one. Sounds great! Used that Andrew Carrell layout shown Ina few posts up. Used the 2N2222 and 2N3906 with 1N4001 diodes, all stock but I made the input cap switchable between .1 and .022 for added fun. Oh and used 3PDT switch and LED. That funny little knob on the side is for switching Input and Output caps. 2P6T rotary switch. Takes up A LOT of room Was sort of a last minute/spur of the moment mod. Jordan Bosstone is one of my favorite fuzzes. 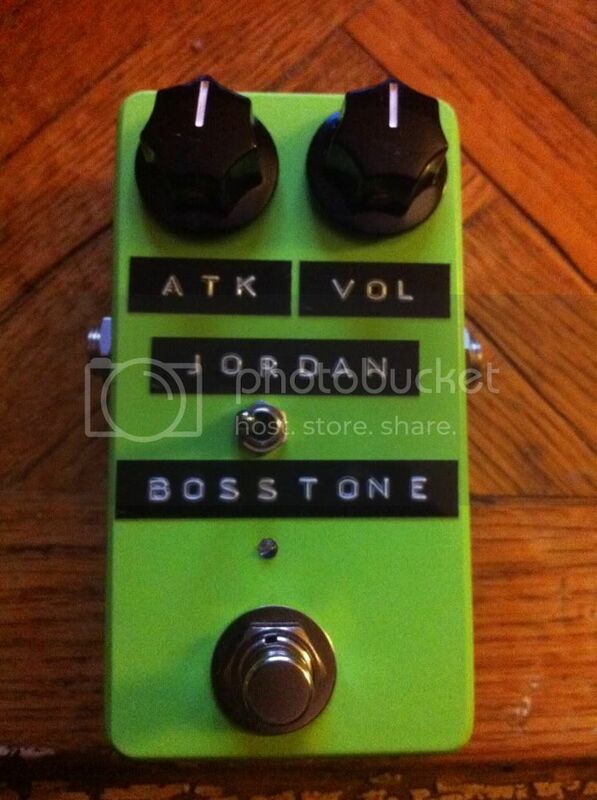 No matter how many fuzzes I cannibalize to build other fuzzes, I make sure to have one workable Bosstone to use. deadllama wrote: For some reason I can't go back and edit my previous post, so I guess I'll make a new one. What do our resident analysis gurus think might be the difference(s) between these two Bosstone clones? I'm not a fuzz man, but i think i will build your version. Gotta be honest, I built mine because Dan Auerbach from the Black Keys has said that it's one of his alltime favorite fuzzes. And that man knows his fuzz. The Bosstone didn't disappoint. And it's actually more versatile than I thought it would be. Question - when you turn the attack knob all the way down (CCW), do you get a strange tone? Mine does. Kinda neat. I'm running mine into a 1972 Fender Musicmaster amp. Some later versions used 6V6 but mine uses 6AQ5A power tubes. Also using an '04 Gibson faded SG special w/P90's. Sounds great! Right on. I think the key, as with most fuzzes and tube amps, is finding that sweet spot so they interact properly. If your amp is set too low, then the fuzz sounds wimpy. But if it's set too high, it can get all mushy when you kick the fuzz on. Gotta find that sweet spot in between.